Believe it or not there exists a link between HMS Bounty, HMS Victory, Thomas Telford and Caerlee Mill - Alexander Brodie. Born at the Riggs of Traquair in 1732, Brodie received a rudimentary education and served an apprenticeship as a blacksmith. In 1751 he left his native parish with his 17s.6d. “har’st fee” and letters of introduction from Lady Conyers, the mother-in-law of the Earl of Traquair and wife of Sir Baldwin Conyers of the county of Huntingdon. He started his working life here on the estates of his sponsor but by 1759 had moved to London. Now a master at his trade, Brodie went into the production of fire gates and dampers and stoves for use in homes. In 1767, with his business partner Richard Williams, received a Royal patent for a fire stove and register. As well as demonstrating great skill in the manufacture of iron products Brodie was also emerging as a shrewd man of business. 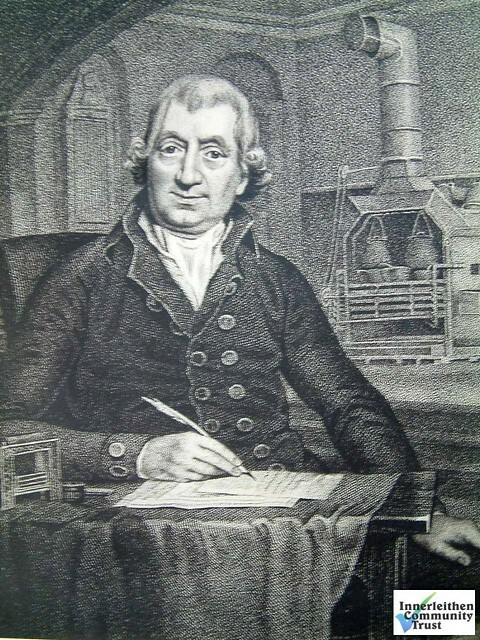 In 1780 he obtained the Royal patent which was to make his fortune – for “A New Ship Stove, Kitchen, Or Hearth, With A Smoak Jack And Iron Boilers, Which Was Preferable To Any Hitherto Discovered Or Made And Would Be Of Public Utility” (Brodie 1780:1). Brodie had not designed this stove from scratch but he had greatly improved an existing pattern and had the acumen to acquire a patent for his version. Constructed of wrought and cast iron, the component parts were bolted together making it easy to dismantle and clean, and to replace worn or damaged parts. A versatile cooker, the Brodie stove was equipped with ovens, hotplates, pivots and spits for baking, boiling and roasting. Waste heat was ducted via a flue at the rear to the ship’s sick bay to provide warmth and keep the area dry. Also included was a still which could produce up to two gallons of drinking water per day. For the next thirty years Brodie was contracted to provide the Royal Navy with ship’s stoves, and all naval vessels of the period were thus equipped, including HMS Bounty (of the infamous mutiny) and Nelson’s flagship, HMS Victory. Brodie’s iron working skills were also applied to the manufacture of armaments. A 24 pounder cannon, marked “ACB” and installed as part of a refit after the battle of Trafalgar, sits by the entrance of the Victory Gallery, Royal Navy Museum. Another example of Brodie’s consummate generosity and thought for his native parish was his offer to ship to Leith, free of all charge, sufficient iron to construct a bridge over the Tweed to link Traquair with the road network north of the river. For reasons unknown the offer was not acted upon and it was over thirty years later before first a wooden bridge, then in 1886 an iron and stone structure, allowed folk to cross dry shod between Innerleithen and Traquair. In the Second Statistical Account of Scotland, the Parish of Traquair, this time written by the Rev John Campbell, 40 years a minister at Traquair, Alexander Brodie was remembered thus: “When he left Scotland, unlike most Scotsmen, he was very ill educated, and to his latest day could with difficulty sign his own name.” Rather ironic when you see him in his portrait (reproduced in Buchan’s History of Peeblesshire) feather quill in hand! His life achievements were summarised – “by his own genius or, as some pretend, by purchasing from an Italian the plan of register stoves, he accumulated a fortune of nearly half a million.” The writer, perhaps noting the lack of a bequest to the parish, laments that the only memorials to this great son of the Parish are a marble slab in the wall of Traquair Kirk and a Bible presented to the pulpit in 1777. Innerleithen Provost Robert Mathieson records in Buchan’s History of Peeblesshire (1924) that in 1786 Alexander Brodie of Carey Street, London, entered into negotiations for ground on which to erect a woollen factory. He acquired the half acre on which Thomas Ovens had built a house and a further quarter acre from James Tait, carpet weaver, on which had been built a house and a yard. Building work began almost immediately and the factory was completed around 1788, becoming fully operational by 1790. The original building still forms part of the modern factory complex which is situated in Damside, the street named after “The Dam”, the local appellation for the mill lade constructed to provide power and washing water for the mill. Brodie spent upwards of £3000 on the works and machinery of the latest and best quality. In 1792 he obtained the tack of the Waulkmill of Innerleithen and another quarter acre on which Robert Gill had built a house and yard. His great philanthropy led to the founding of a woollen industry in Innerleithen and at the time “Brodie’s Mill” was the largest and best equipped in the Borders. Initially, the factory was not a commercial success. There was no one with experience in how to run a modern textile mill to its best advantage, and this early in the “industrial revolution” Innerleithen lacked a trained and disciplined workforce able to cope with the rigours of the almost relentless time-keeping required to keep factory hours. When the building was purchased and modernised around 1840 by Robert Gill, a man who knew the textile business, “Gill’s Mill” soon showed the potential Innerleithen had for the production of quality woollen yarn and cloth. By the end of the decade “Dobson’s Mill” (Leithen Mills) and St. Ronan’s Mill were in full production and by 1900 Innerleithen was as prosperous a mill town as any in the Borders. Iron turns into irony when you consider that Caerlee Mill is the only one left standing, even if the part built by Brodie is little used today. Alexander Brodie died on 6th January 1811 at the age of 78 and was buried in Cheswick churchyard in the county of Middlesex (London). He does not appear to have married for he left his entire fortune to his nephews and nieces. A nephew, also Alexander, took over the Calcutt ironworks and a niece had the duty of overseeing his interests in his Innerleithen factory. An office block in modern Telford is known as Brodie House and Calcutts House, a rather posh hotel, boasts both a Thomas Telford room and an Alexander Brodie room. He is remembered locally by the memorial tablet on the wall of Traquair Kirk. Though he never resided in Innerleithen his gift to the town and the mark he put on its history deserves some form of visible acknowledgement, even if it is just a simple blue plaque mounted on the wall of the listed structure he built and duplicated on the Damside boundary to inform the passing public.